Turn Key House, Large 2 Bed 2 Bath 2 Car Garage Home located on the North Golf course with open sunset views from the Lanai with Hot tub. New appliances and modern furniture with large Flat screen TV's in Living room, and both bedrooms. 2 Guest passes included for Sun City community center which has 3 heated pools, golf, tennis and over 100 clubs and activities. 2 Bicycles in garage to use. Bring your Golf Clubs and Bathing Suits! 8 golf courses in Sun City Center alone and many more in the surrounding area. Golf cart at house and included in rental, as well as 2 sets of golf clubs and tennis rackets available for use. 2 Bathrooms leading from the bedrooms with separate doors and entrances for privacy. 55+ Resort community with over 100 clubs, 3 swimming pools, Tennis, Softball fields and Dog parks. A Keurig single cup maker and a regular coffee maker. Coffee for both machines. Cleaning products, towels and TP, paper towels for kitchen, bathroom and laundry soap provided initially. Dishes and pans and utensils provided. 3 Heated pools at Community center. 2 Guest passes to the community center which has 3 heated pools and over 100 clubs, parks and recreation for all, including a dog park. attentive to any need or question and has provided everything to make one's stay relaxing and enjoyable. The Sun City Center environment is so much fun and convenient to be able to enjoy all that Florida has to offer. What I enjoy most is sitting on the back porch watching the Sand Hill Cranes walk across the back yard, seeing the sunsets and having the quite evenings to walk my dog through the neighborhood. It warms my heart that you and Dakota feel at home and enjoy the surroundings! Erik C.Where do you live? Loved our stay at this home. Kim was very nice and helpful making sure we had everything we needed. Views out the back were wonderful. We loved taking rides in the supplied golf cart, quick shopping trips in the cart are possible in this community. The screened-in garage is a nice plus. Nice tv's and lots of channels. Had a good fast internet connection. The pools and facilities at Sun City Center were great, we would like to join some of the clubs if we stayed longer. We stayed for a week in Sun City Center looking for a place to purchase. Kim’s house was paradise! We had the whole experience of living like a resident. Kim gave us the use of a golf cart and badges to go to any activity we wanted to try. They have over 200 clubs to pick from! The house was beautiful! Kim greeted us when we arrived and gave us the run down on the community and how to use appliances, golf cart, and hot tub! We would recommend Kim’s house to anyone wanting to have the Sun City Center experience! Also, the white sandy beaches are less than an hour a way. It is a little bit of paradise in the Tampa Bay Area! Well kept, clean and quiet. It truly was a home away from home. Kim was very accommodating. Any problems she is right on it. Would definitely recommend. Stayed for the month of June 2018 with my brother and my dog. Wonderful 2 bedroom home, each with a walk in closet and private bathroom and a TV. Nice kitchen with everything you could need and new appliances. We felt very at home and really appreciated that we could bring the dog. Thank you, Kim. Close to Tampa airport. Tampa Bay beach is 9 miles and can be at Anna Maria Island beach 30 min and St. Pete Beach in 35 min and Siesta Key beach in 45 min. 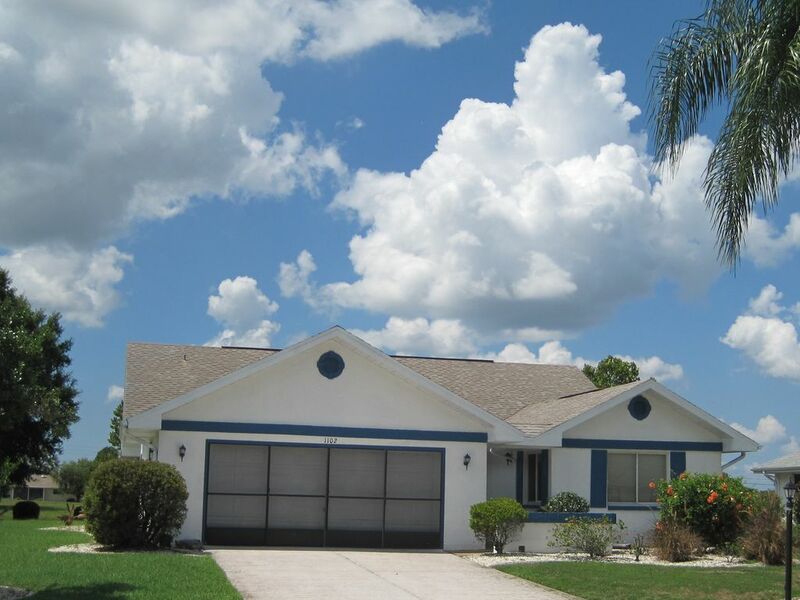 Close to the Tampa Bay with restaurants and beaches 10 min. 8 golf courses in Sun City Center and many more in the surrounding area. Please contact owner if you want to book for less days then listed.